Notice it is “de-Light” not “de-dark”. Light means “a source of illumination”. What is your Source of Light? What delights you? What illuminates you from the inside out when the world is collapsing around you, pressing against you? What reminds you of the light within when you are surrounded by darkness? Have you forgotten how to delight in the simple pleasures of life? Have you been too busy doing, rather than “be-ing”? Stop it! Go BE in nature! Since I moved out of the city, removed myself from the rat race and have been living in the boreal forest in a cabin by the lake, I am discovering how delightful the world is. I am happier with less. I am discovering the beauty around me. I am delighted by the simple pleasures of life. I am, like a child again, returned to innocence & squealing with delight! I have found my way home to myself! The sparkles of the morning sunshine dancing on the lake bring me great joy and delight. I delight in these fleeting moments of magic & mystery. I am laughing more and I am laughing EVERY day – for no reason! I am squealing with delight. I am delighted every day by nature, by God. Delight – “a cause or source of great pleasure”. Delight in = “take great pleasure in”. Delight = “a high degree of pleasure or enjoyment”. Delight = “Joy. Rapture”. Delight = “great pleasure; extreme satisfaction” (dictionary.com). Nature delights me & calls me to the present moment. Nature draws me in. Nature wows me & takes my breath away. Nature humbles me. Nature reminds me how small and insignificant I am. Nature reminds me that life is cyclical. Nature reminds me that everyone and everything will die; everyone I love will die. Nature reminds me that there is a time to rest. There is a time to dance on the lake. I watched the ducks dance on the lake in courtship on the morning I wrote this. There is a time to get wet. There is a time to plant seeds. There is a time to do nothing. There is a time to just be, to look at the clouds. There is a time to let the sunshine dance and sparkle on your toes. 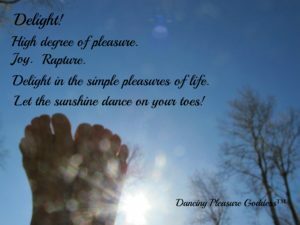 The photo of the sunshine sparkling and dancing on my toes was taken a week before I wrote this. I was laying on the fresh spring grass outside, doing nothing, just delighting in the play of the morning light kissing everything. Suddenly my toes took themselves upwards toward the sky. And I squealed with delight as I witnessed the orbs of magnificent sparkly light dancing and shining on my toes. There is a time to take photos. There is a time to be playful. There is a time to laugh. There is a time to cry. There is a time to fall apart. All flowers lose their petals. Trees lose their leaves. Nature falls apart on a regular basis. Nature falls apart cyclically. Nature falls apart unexpectedly. A sudden hail storm can destroy and rip away all of the petals on the flowers. Nature is full of extremes. I am full of extremes. I go from falling apart & crying uncontrollably for a moment or days to squealing with delight in another moment. I am alive! BE alive! I believe that most people are barely alive, just going thru the motions of life. Some of my city friends ask me if I am bored here. That makes me squeal with delight! No friends living nearby. No coffee shops. No stores nearby. The city drains me now. I can’t wait to leave. Nature nourishes me. The snowshoe hare that blessed me with her presence this morning is my friend. I am never alone. I am surrounded by Source energy. On the morning I wrote this, 25 ducks were swimming, feeding, playing, landing, splashing, flying & dancing on the lake in the sunshine. I drank my coffee outside barefoot on the grass, blue open expansive sky above me, delighting in the sun kissing every living thing. I live barefoot here. No high heel shoes for this girl! I am more connected to Mother Earth. I live more in the flow. I am not in a hurry. I am often wrapped in a blanket of silence or a symphony of birds singing. I have many moments of pausing, opening to what is divine intended for me to do next. I write more. I read more. I don’t watch TV. I greet each day, each sunrise, each kiss, each “I love you” as though it might be my last. Wake up each morning. Breathe in the beauty around you & imagine that this is your last moment, your last day on earth, and your last breath. This really is it. There is no tomorrow. Now look around you again. Wow! This is it! Living by the lake and amidst nature it is easier to slow down. I drink & savour my morning coffee more slowly. Slow is more delicious. I linger longer in sweet kisses with my beloved. Knowing each one could be my last. There are no city lights here. No TV. I go to bed earlier. I wake up without an alarm clock (have for over 13 years). I wake up feeling rested. I can’t wait to get out of bed and see what morning beauty God has painted in the sky. Delight calls me, especially in the morning, to come and play. I am flow. I take more photos. I express more gratitude & appreciation. I say “I love you” more often. I go to bed complete, at peace. I am filled to overflow by the beauty around me. I bathe myself in the silence. I delight in solitude. I cry often. I laugh often. I enJOY my own company. When was the last time you squealed with delight like an innocent child? When is the last time you laughed uncontrollably? Go and BE de-LIGHT-ed by the world around you. Let the mystery & magic delight you. Let the beauty be a source of extreme pleasure, extreme satisfaction, and extreme joy. Be unreasonably happy. Be extreme JOY! Laugh til you snort. Your laugh is your song. Sing it. Your laugh is like no other laugh. Go S-Q-U-E-A-L with delight! Take time EVERY day to squeal with deLight! BE deLIGHT!